Are you intimidated by all those hard-bodied pretzel poses? Do you want to experience the life enhancing benefits of yoga? 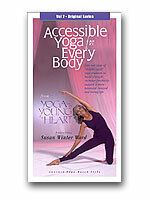 Yoga for the Young at Heart brings you Accessible Yoga for Every Body! Let these Baby Boomers inspire you to develop the vitality and tranquility you want in your life. Join this class of mature yoga students and build strength, increase flexibility, support a more balanced, relaxed and loving life. A beginner is a beginner at any age and you won’t begin any younger, so start now! Running time 58 min.